Scene and Story: June - Jill Ruth & Co. The day was overcast and chilly and the view was spectacular! 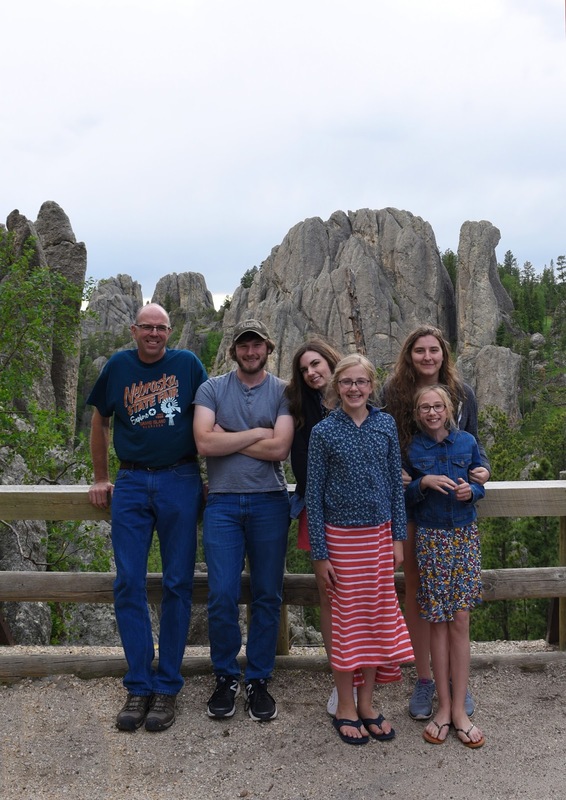 We drove up Needles Highway in the Black Hills and I remembered the fear I had when 40 years earlier there was talk of brakes overheating and a conviction that my Dad didn't know how dangerous the road was. Now, it's my husband and me in the driver's seat. Kind of fun to not be feeling like I'm at the mercy of someone else. Okay, there were a couple of times when I wasn't driving that I gripped the seat a little tight! This is the summit and there were quite a few motorcycles around and people milling about taking a break after driving up. I think we all silently wished that the others would leave so we could enjoy this space all to ourselves. We were facing an hour's drive yet back to our cabin, not wanting to drive the way in the dark, and we were hungry, so we did not even try to outlast the other tourists. 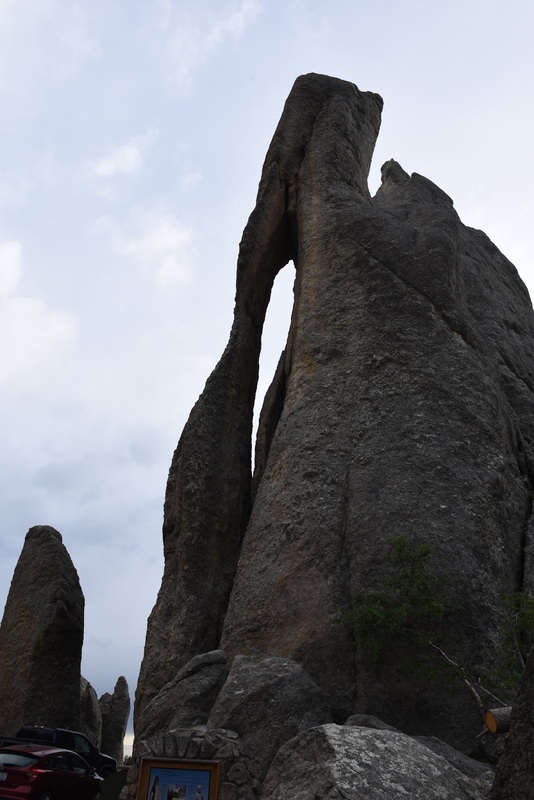 And, if you've never been here, this is the "Eye of the Needle" at the top of Needles Highway. I'm joining Sarah for Scene and Story. What an amazing rock formation called "The Eye of the Needle". Well-named! You got a good family line-up for the souvenir photo! Those windy roads, never my favorite. Not sure the view from the front is any better, but my stomach does much better up front. Adorable family. This looks like a fantastic place to visit - I can imagine that it is popular, and I understand hoping for a few moments to enjoy on your own! Your family photo is wonderful - you'll have memories of this day for a long time. Thank you for sharing this photo and the one of the Eye of the Needle. We traveled this same road last summer. Isn't it just amazing? I have a photo of My Mann and me in front to the Eye of the Needle. Thanks for the memories.